UPDATE February 2, 2007: We’ve been informed by Logitech that as of late 2006, the mm50 no longer includes a data port for syncing your iPod with your computer. Here at Playlist, we see pretty much every speaker system released for the iPod, and we’ve reviewed a good many of them. One thing we’ve found is that when it comes to “portable” speakers, even the best products are a tradeoff between size and sound quality. For example, the best “portable” sound we’ve heard is Altec Lansing’s $250 inMotion iM7, but it’s also the largest portable system on the market; Altec’s $180 inMotion iM3 and Logic 3’s $100 i-Station are each much more compact, but sacrifice ultimate sound quality in the name of that portability. Logitech’s latest entry into the portable iPod speaker market, the $150 mm50 , stakes its claim to the near-perfect middle ground, offering better sound than the competition in a package that isn’t much bigger—and at a price that’s very competitive. If you’ve seen many portable iPod speaker systems, what immediately stands out about the Logitech mm50 is what it’s not : The body of the system doesn’t fold up. Rather, it’s a solid, white plastic chunk measuring 12.75" x 3.75" x 1.4"—shorter but wider than the inMotion iM3, and slightly bigger in overall volume. (The mm50 is also half a pound heavier than the iM3.) During use, two 3.5" arms swing out from the base of the mm50 and act as stands; each of these sturdy metal arms has two thick rubber feet that keep the system from sliding around (and protect your furniture). The front of the mm50 is covered by a thick, gray metal grill, behind which sit the system’s four speaker drivers: two (left and right) of Logitech’s “Max-X high excursion drivers” and two corresponding “pressure drivers” for better bass response. In the center is the familiar iPod dock-connector cradle, which holds any dockable iPod. 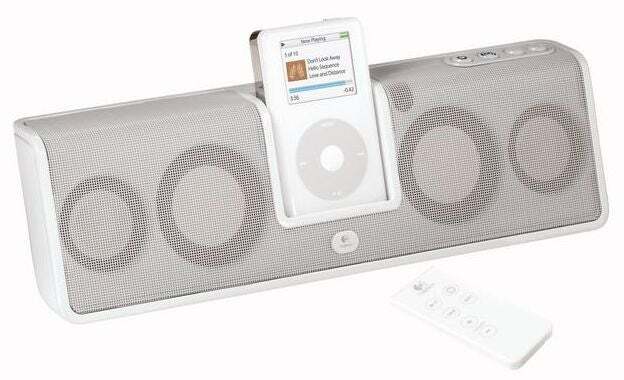 (Without an adapter, the cradle holds all 40GB and 60GB models, as well as 30GB 3rd-generation iPods; two adapters are included to fit mini iPods and all other full-size iPods, respectively.) 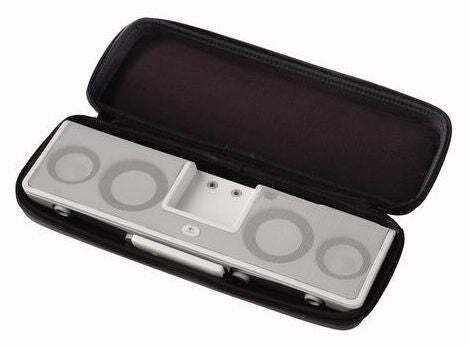 The dock connector grabs line-level audio from your iPod’s dock port, while allowing you to control your iPod with the included remote. Your iPod is also charged via the dock connector when the mm50 is running off AC power. You can also control both the mm50 and your iPod via the included infrared remote. Contrary to the mm50’s manual, which claims the remote has only six buttons, it actually has seven: play/pause, power, back, forward, volume up, volume down, and 3D. The play/pause, back, and forward buttons control iPod playback; the volume and 3D buttons control the mm50’s output. The remote is nearly identical to those used in Altec Lansing’s portable systems, and works about as well: That is, it functions fine from across a small room, provided you’re on approximately the same plane as the mm50; too far above or below it, and it’s not entirely reliable. But my biggest complaint about the remote is that there’s no place on the mm50 to store it. The included carrying case has a slot for it, but it would have been nice to have a clip or slot somewhere on the mm50 itself. Finally, the back of the mm50 provides three jacks: a power jack to connect the unit’s AC adapter, a dock connector cable port, and an audio input jack. Like Altec Lansing’s iM3, you can connect your iPod’s dock connector cable directly to the mm50; doing so means that whenever you place your iPod in the mm50 and the cable is connected, your iPod will sync with your computer. The audio input jack lets you use the mm50 with any other audio source, such as your computer, a portable radio or CD player, or even an iPod shuffle; plugging a cable into this jack mutes the iPod’s audio. In addition to the cradle adapters and AC adapter, the mm50 also comes with a semi-rigid carrying case that holds the mm50 and remote. I mentioned above that the mm50’s swing-out stands feel well built; in fact, “well built” is a description I kept coming back to when testing the mm50. The one-piece body is impressively solid for a portable speaker system; the gray speaker grill is made of stiffer metal than that found on competing portable speakers; and even the buttons on top of the mm50 feel like they were made to take abuse. If my initial impressions of the mm50 are any indication of its long-term durability, it should hold up well in a portable environment—not something I can comfortably say about all the portable systems we’ve seen. I mentioned “charging” the mm50’s battery above. Yes, this means the mm50 runs off a rechargeable battery—a Lithium-Ion one, to be precise. According to Logitech, the battery should supply around 10 hours of playback at moderate levels. (In my testing, that appears to be an accurate estimate; listening loud does shorten playback time.) Whenever the mm50 is powered via the AC adapter, the battery is charged, as well. The decision by Logitech to use a rechargeable battery in the mm50 is not one without tradeoffs. On the positive side, you don’t have to purchase an endless stream of batteries, or remember to remove and charge rechargeable cells. It also makes the mm50 feel more solid, as there are no flimsy plastic battery doors to break off. On the other hand, it means that if you plan on using the mm50 for longer than a single charge—for example, on a trip—you need to bring the AC adapter along. I mentioned at the beginning of this review that portable speakers are generally a compromise between sound and size. The mm50 is the best such compromise I’ve seen. Although it’s slightly bigger than most of its competition, the mm50 is still small enough to fit in a backpack or suitcase, while providing significantly better sound quality. In standard (non-“3D Sound”) mode, the mm50 provides a fairly balanced overall sound, with good detail, midrange, and upper bass. (The laws of physics dictate that you won’t get real bass in a system this small.) Thanks to its larger body—which isn’t structurally interrupted by a folding design—the mm50’s drivers are larger and placed in larger enclosures than the drivers of competing systems, giving the mm50 the best low-end response of the truly portable products we’ve tested. This is especially noticeable in the lower midrange, which is where such systems get much of their “presence.” In fact, next to the mm50, the Altec Lansing iM3—our previous favorite system in the truly portable range—sounds slightly tinny and thin. Then there’s the “3D Stereo” feature. Small, portable speakers generally don’t have much stereo separation, simply because their drivers are so close together relative to the listener. In an attempt to produce better perceived separation, many small speakers include a processor designed to provide “3D” or “surround” sound. Unfortunately, these processors rarely work, instead providing a fake, echo-ey effect. But mm50’s 3D Stereo mode was a pleasant surprise, at least with some music. On many tracks, the 3D feature provides a surprisingly wide soundstage, with instruments appearing to emerge from outside the speakers. On a few songs in particular, I was shocked by how much better the 3D Stereo mode sounded. (Admittedly, part of this surprise was due to my skepticism towards such effects in general.) That being said, 3D mode isn’t for every song or type of music—some tracks benefit from it, some don’t, and some sound worse with it. And the effect sounds much better from a few feet away, or across the room, than it does when the speaker is sitting right in front of you. If it sounds like I’m excited about the mm50’s sound quality, I am. Unlike many portable speaker systems, which have to be evaluated solely in the context of their size, the mm50 provides good sound quality in spite of its size. Of course, it’s still a small, portable system, so it’s not going to sound as good as a home system, or even a larger “transportable” system such as the Altec Lansing iM7. But it’s quite enjoyable to listen to, and at this size, that’s saying something. The Logitech mm50 is a welcome addition to the portable iPod speaker market. Although it’s slightly bigger than the competition, its build and sound quality are the best I’ve seen in a truly portable speaker; it’s got all of the features people have come to expect; and at an MSRP $30 less than our previous favorite, the Altec Lansing inMotion iM3—not to mention that street prices on Logitech products tend to be significantly lower than MSRP—it’s a relative bargain. I’ve got a new favorite portable speaker system. For more on speakers, please visit the Playlist Product Guide.